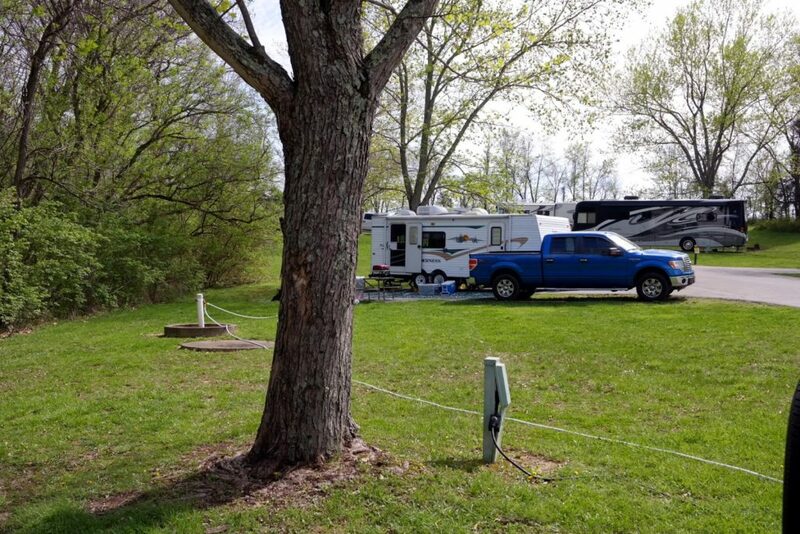 This past weekend Jason and I went camping at Big Bone Lick State Park in Union, Kentucky. 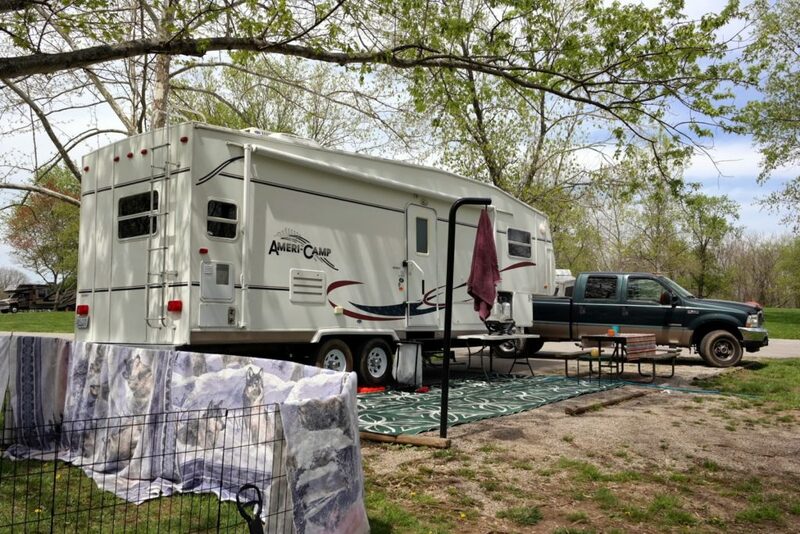 This was our first trip out with the new (to us) Ameri-Camp fifth wheel camper and our first trip out for 2015. 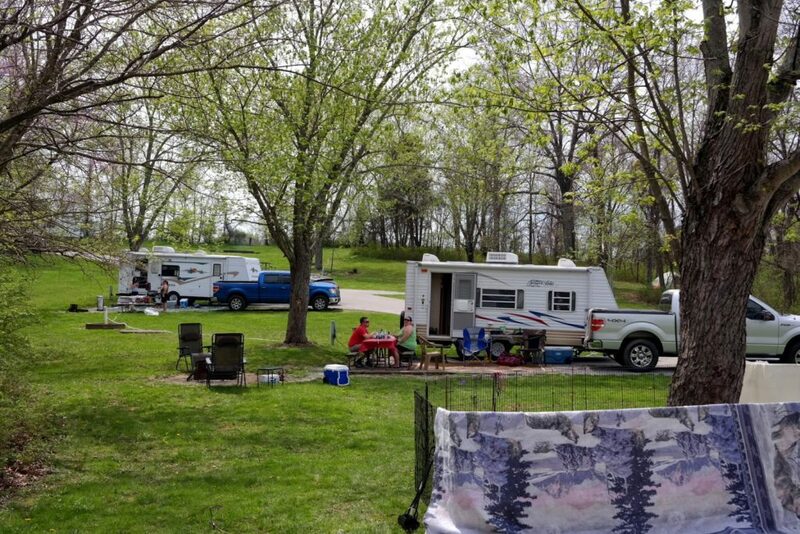 We had perfect weather and had three RV sites with four other friends – Christina, Charlie, Beth and Lydia. 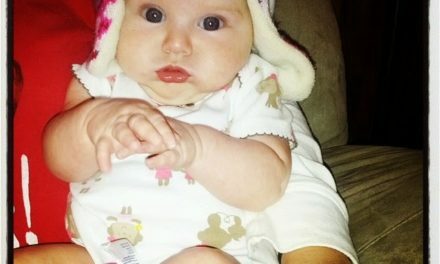 Beth had her new rig out for the first time and Lydia came for a night and bunked up with her. Charlie and Christina have their own rig and we almost always camp together. The park was very clean and fairly quiet for how busy it was. There is a pool (which wasn’t open for the season yet), a mini golf course, a dump station, a small camp store, a gift shop and a very nice bathhouse with three nice sized shower stalls and three toilet stalls. 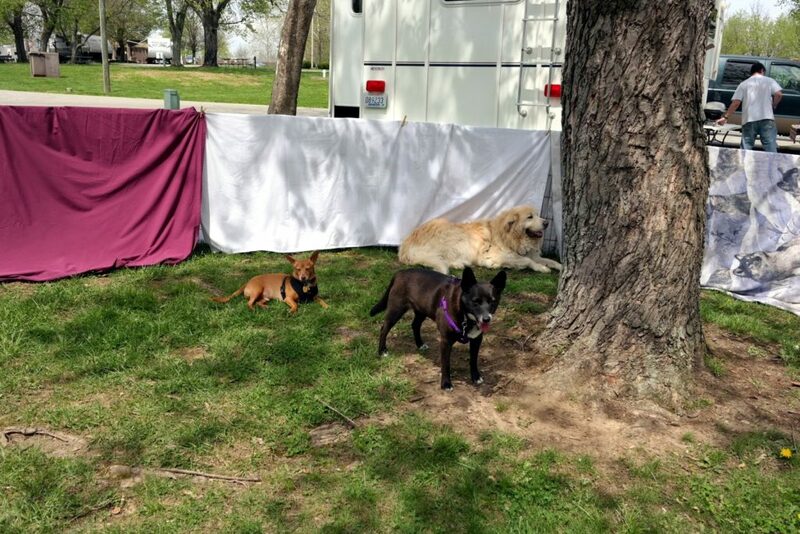 The 62 RV sites offer 30 amp electric service and water hookups that are shared between two sites (50+ feet of water hose is a must for water hookups). There are no sewer options on the sites, but there is a dump station on the premises. No WiFi or cable here either, though we were only in the camper to sleep and prep food so that wasn’t an issue for us for a weekend trip. We did have 3G on our Verizon signal. area because we wanted to see the new baby bison that was born the previous week. 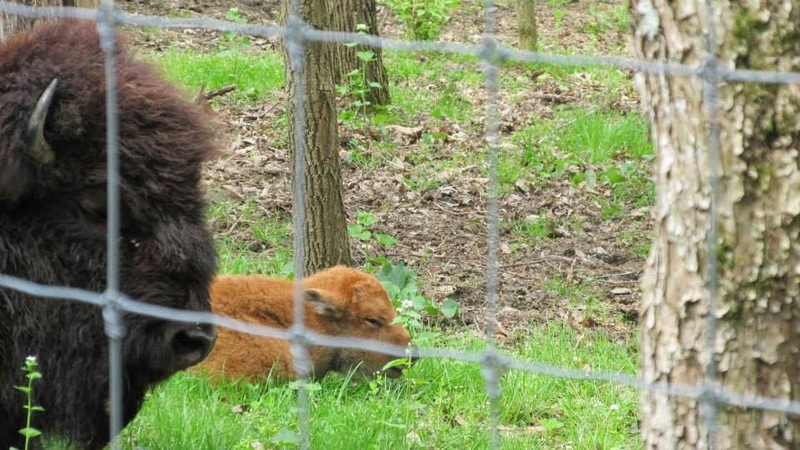 We were told momma bison was in labor for a week – yikes, poor momma! 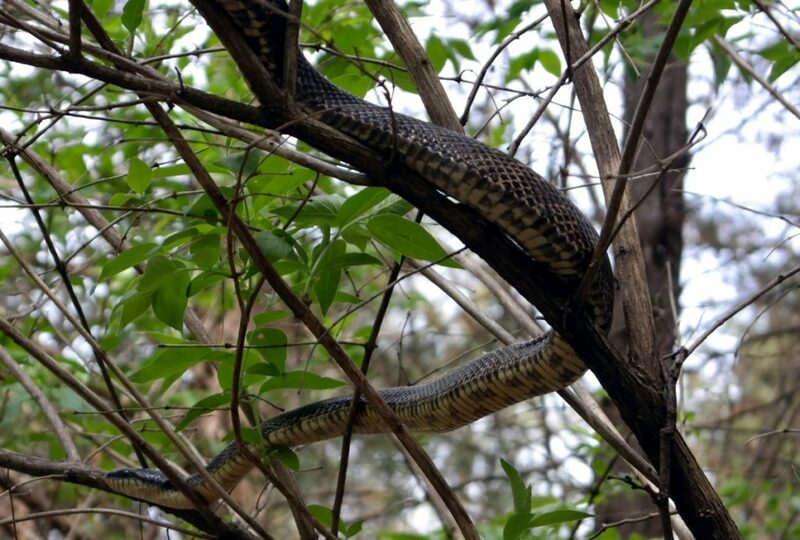 On the way back we were told by hikers passing by about a large snake in a tree up the hill. Sure enough, there was a large black racer slithering around the branches just beside the trail. Apparently the park staff keeps moving him further into the woods, but he keeps making his way back to the trail paths and is spotted often. Some other areas of the park that we didn’t get to check out were the lake, the museum and the church that is known for ghost hauntings. Hopefully we can go back again and check out the rest of the park. It was a very nice park to visit and we would definitely visit again. We took all three dogs with us on this trip and they all did great! We set up their XPens around a tree for some shade but where they could see us no matter whose site we were at. They need a little bit of work with barking at passing dogs, but they get better with each trip and we’re working on the barking. The last thing we want to do is annoy other campers. Overall, they do great and they love to go with us on our camping adventures! 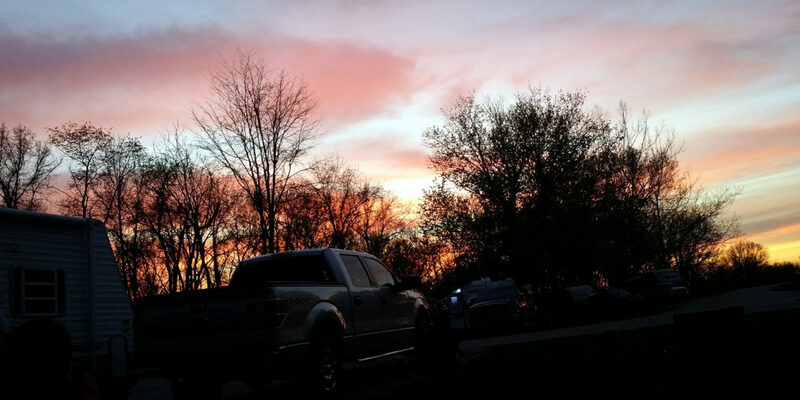 See all of our trip photos in the Big Bone Lick camping photo gallery.